i quite enjoy seeing what peoples beauty essentials are. maybe thats a little weird but well, i bet i’m not the only one. lately i really liked peoples night stand posts or videos and actually i wanted to do something like that but i don’t have a night stand. it just doesn’t fit into my room, so i have my beauty essentials on my vanity, always ready for use and products i just reach for the most. so today, i’m gonna show you my vanity essentials which are in my daily use. first off all, the soap&glory hand food. its the bigger bottle with the pump which is so handy. my sister got me this one for christmas and i was so thankful. 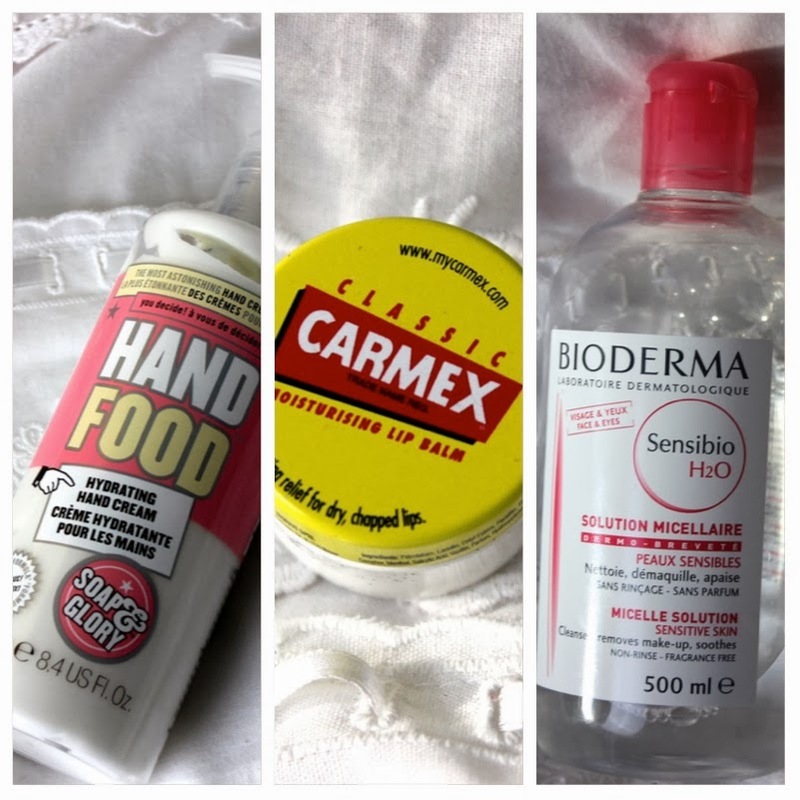 my hands tend to get quite dry and i hate the feeling of dry hands with a passion, so i make sure to moisturize them as often as i can. this hand cream smells really nice and sinks in so quickly without leaving the hands sticky. a huge plus and since i have it, my hands are feeling so much softer. i would probably just forget to use hand cream thats why i put this on my vanity so it reminds me to use it. if you’re looking for a good hand cream, check this one out. its available in a hang bag sized tube and the packaging is soooo damn cute. not only my hands get dry, my lips do aswell and lately it had been so horrible, so i went to the drugstore and got a little pot of one of my favourite lip balms ever. its the good old carmex. it always worked for me, it leaves my lips so moisturized, it has no color to it and it just does its job. i use it in the morning and in the evening and whenever i feel my lips need a little extra something. and it is really cheap. i don’t know why there are lip balms for over 10€. i just don’t see the need. this product has been raved about so much and i still use it and love it. its the bioderma sensibio micellaire water. its awesome for taking off eye make up and make up in general, its a nice refreshment for the skin and i just love it. this huge bottle goes such a long way. i got it back in the summer and its still so much left. its super gentle. thats why i love it so much and highly recommend it to everyone. i use it daily to take off my make up, clean up any mistakes at my eye make up and i just love it a lot. so guys, these are my vanity essentials. do you have such products, or the typical night stand products? i would love to know. love you. again, i you haven’t already, subscribe to my youtube channel here. "My Favourite Beauty Products of 2013"